Each month as part of this series from the AAS Historical Astronomy Division, an important discovery or memorable event in the history of astronomy will be highlighted. This month, guest author Jason E. Ybarra of Bridgewater College focuses on Algol — the well-known variable star that changes every 2.867 days. September brings us the constellation of Perseus rising in the evening. In Greek mythology, the young hero Perseus is sent to behead the Gorgon Medusa, a winged female monster described as having snakes for hair, boar tusks, and a lethal gaze. 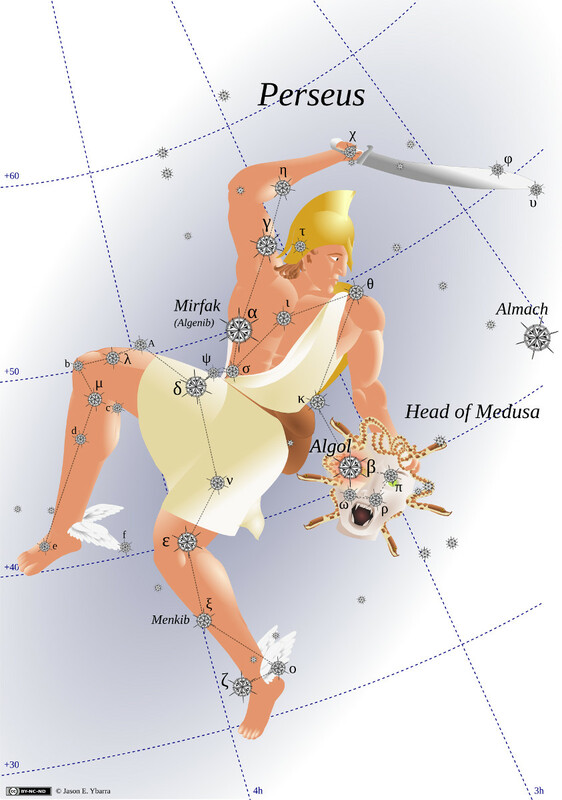 The bright star Algol, along with three nearby stars (π, ρ, and ω Persei) within the constellation, form Medusa’s head 1. The name Algol comes to us from the Arabic Ra’s al-Ghūl, translated as the “Ghoul’s Head”. In the Arabic Ptolemaic tradition, the constellation Perseus is known as Ḥāmil Ra’s al-Ghūl, translated as “he that carries the ghoul’s head” 1,2. The ghoul in Arabic culture was a malicious desert-dwelling creature, luring travelers to their deaths. The 12th century astronomer Abraham bar Ḥiyya translated the star’s name from Arabic to Hebrew as Rosh ha-Shed, “the head of the demon” 2, and Algol became known in medieval Europe as the “demon star”. Algol is a well-known variable star. Most of the time, it has a visual magnitude of +2.1, but every 2.867 days it will dip in brightness by 1.3 magnitudes over the course of approximately 4 hours, a change easily detectable with the naked eye. It is highly likely that ancient observers of the night sky noticed Algol’s variability; however, there is no mention of it in historical records, except for possibly being encoded in an ancient Egyptian calendar 3. A century later, English astronomer Edward Pigott began observing variable stars from a private observatory behind his house. His friend and neighbor John Goodricke subsequently joined him, and on 12 November 1782 they made their first observation of Algol dimming 6. They continued observing Algol for the next five months, until they were able to determine its period. Goodricke submitted a report to the Royal Society of London which detailed their observations, reported the period of variability, and postulated the dimming might be due to an “interposition of a large body revolving round Algol” 7. In 1880, American astronomer Edward Charles Pickering defined a class of variable stars, known as Algol-type, as those which most of the time have a constant brightness, but periodically lose their brightness rapidly, and then regain it just as rapidly. He argued the cause to be an eclipsing body that passes between the star and observer, and went further using observational data of Algol to estimate the orbital parameters of its satellite 8. Pickering continued his interest in variable stars, hiring Henrietta Swan Leavitt to catalog and analyze observational data, which led to Leavitt’s discovery of the period-luminosity relationship for Cepheid variables, known as Leavitt’s Law. In 1882, German astronomer Hermann Carl Vogel was appointed director of the Potsdam Astrophysical Observatory, and set about measuring the radial velocities of stars using the newly invented spectrograph. In 1889, Vogel confirmed Pickering’s eclipse theory with observations of Algol’s spectrum, showing it to be a spectroscopic binary 9. Nowadays the number of known eclipsing binaries is in the thousands, and observations of them are used by astrophysicists to measure fundamental parameters such as stellar masses and sizes 10. † The author is indebted to Andrealuna Pizzetti of the Osservatorio Astronomico Geminiano Montanari for help with the translation. 1. Allen, R. H. (1899). Star-names and their meaning. New York, G. E. Stechert. 3. Jetsu, L., Porceddu, S., Lyytinen, J., et al. (2013). Did the Ancient Egyptians Record the Period of the Eclipsing Binary Algol—The Raging One? The Astrophysical Journal, 773(1), id. 1. 10. Andersen, J (1991). Accurate masses and radii of normal stars. Astronomy & Astrophysics Review, 3, 2.